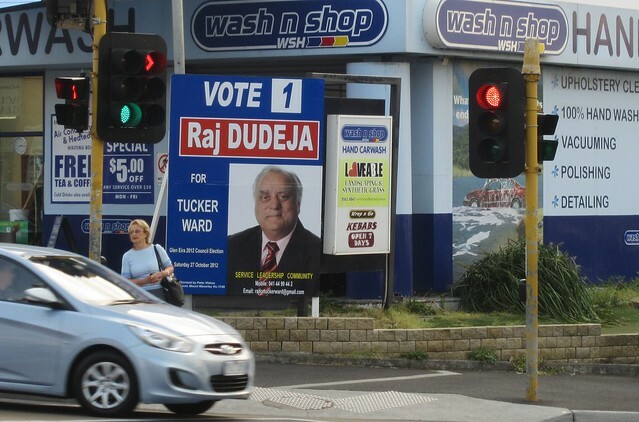 Do we really need footpaths on both sides of the street, in every street in Tucker Ward? There are plenty of places without footpaths or footpaths just on one side. This would save a whole lot of concrete / resources and it looks much better. 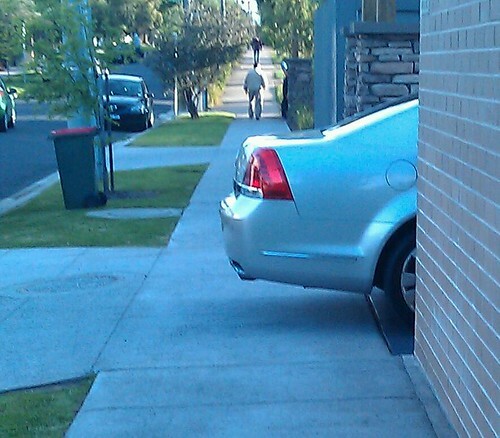 Yes, we quite definitely need footpaths on both sides of the street. There are few things that make pedestrians (and by definition, this includes all public transport users) feel like second class citizens more than a lack of footpaths. In many cases it forces people to cross roads where they wouldn’t otherwise be compelled to — in some cases twice, to avoid walking on the grass. It’s doubly worse for those of limited mobility, including those with wheelchairs and other walking aids, and for parents with prams. A side effect of no footpaths is blurred property boundaries, resulting in some overzealous home owners encroaching, resulting in public space effectively lost. I spoke to Brett’s running mate Rose Read at Bentleigh station on Thursday morning. I think she has an understanding of why I disagree with Brett. Brett has emphasised in an update overnight that his comment shouldn’t be taken out of context, and that’s fair enough. It’s not like he was stating a big policy position — he was just kicking an idea around. This is worth emphasising: I must give Brett credit for engaging with the community, throwing his thoughts out there and being willing to debate and discuss them, which is a lot more than some other candidates have done. But I’d be frankly horrified if it was actually proposed to start removing any footpaths, or routinely build streets with only one. In East Bentleigh, the area behind Valkstone Primary School is being re-developed. While most of the streets have footpaths on both sides, the access road (pictured above) east through to GESAC and East Boundary Road only has a path on the southern side, so if you’re from the north side of the access road, headed north on foot, you have to cross it twice… and this being the only road out in that direction, is likely to get reasonably busy at peak times when the estate is finished. Sure, open space is a concern. But changes such as only providing one footpath will actively discourage walking and public transport, and encourage car use — that’s no solution at all in urban environments. One possible way forward (not in the example above, but in quiet streets that don’t get through-traffic) might be what the Dutch call woonerfs — shared spaces, where the road is de-emphasised, allowing other users into the space, slowing down cars and making more effective use of space. 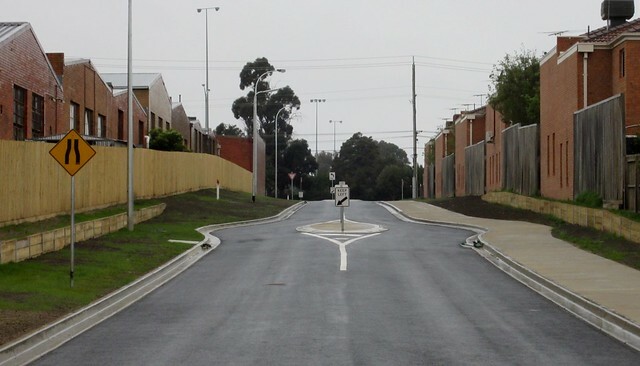 In Australian terms it’s (more or less) a Shared Zone, and there are examples such as this one on the Williamstown Rifle Range estate, developed about 15 years ago. 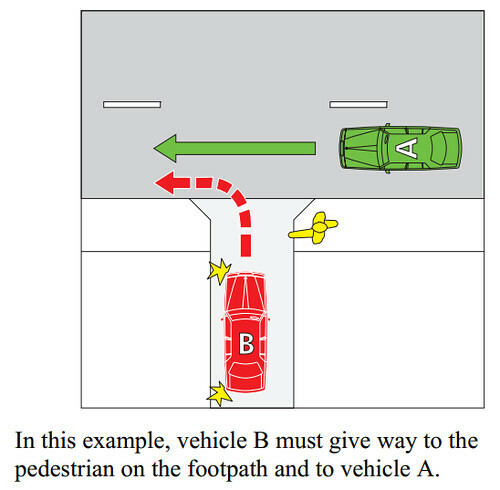 That said, I wonder if the average person understands how to use a Shared Zone — in particular that the law says that vehicles must give way to pedestrians. 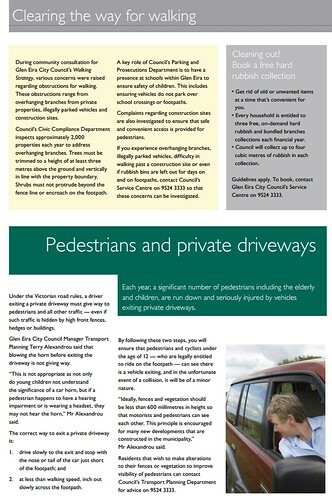 But whatever the solution, the last thing we’d want around here is more streets missing footpaths. Just a few notes about the council elections, which officially take place on Saturday (though many areas are postal ballots, thus a lot of people have already voted). A fascinating article in The Age the other day with former Glen Eira mayor Helen Whiteside saying she wonders why people bother trying to get onto the council. The two Greens candidates have been particularly prominent, as have incumbents Oscar Lobo and Jamie Hyams. New independent Newton Gatoff has been out and about both on the street and in his decorated car, and I’ve also spotted Rodney Andonopoulos been driving around. I think I’ve spotted Phillip De’Ath (my kids jokingly call him Phillip Death) and a few others handing out their brochures and talking to constituents. Apparently it’s been similar in other wards. Those I’ve asked how they think they’ll go say they really have no idea — the lack of polls makes it impossible to tell. They say it’s just a matter of getting their names out there (hence the use of posters, billboards, and signs on cars). They seem to take the view that most people aren’t that concerned by how the council is run, and agree when I suggest that unless people see garbage piling up in the streets, they assume there’s no problem. 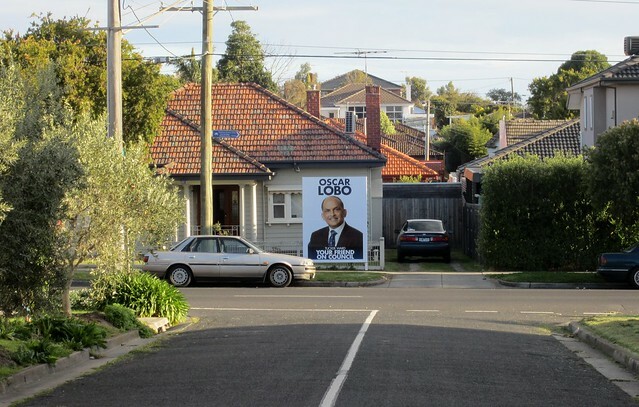 But some of the new candidates have highlighted issues, such as Councillor Penhalluriack’s controversial conflicts of interest, and the recent case of the council wanting to extract a fee from frisbee players in Caulfield Park. 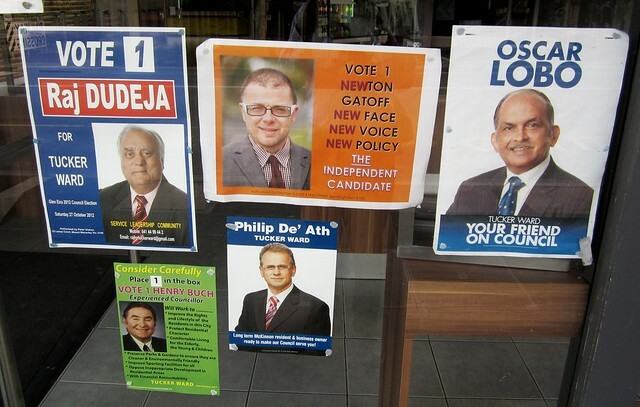 Brett Hedger, Greens Candidate has an interesting Facebook page that profiles other candidates (and tries via the How To Vote cards to identify the stooges and highlight those with undeclared party affiliations) and notes the shops that have apparently taken sides by only accepting one candidate’s poster. It’ll be interesting to see how the vote goes. And given we’re one of the few council areas with attendance voting, I’m hoping that means there’ll be a sausage sizzle on polling day! Property owners who do not comply with a notice within 14 days will be issued with an official warning notice. This provides a further 10 days to complete the work. If action is still not taken within the required timeframe a penalty notice of $200 may be issued and a contractor engaged by Council to undertake the necessary work. The property owner is responsible for the contractor’s fees. This is inconvenient for all footpath users, but can be downright hazardous for those in wheelchairs and other mobility aids, as well as pushing prams and strollers, and children riding their bikes (which is quite legal, I might add). While you occasionally hear of people being rightly fined for it, it doesn’t seem to be very common. 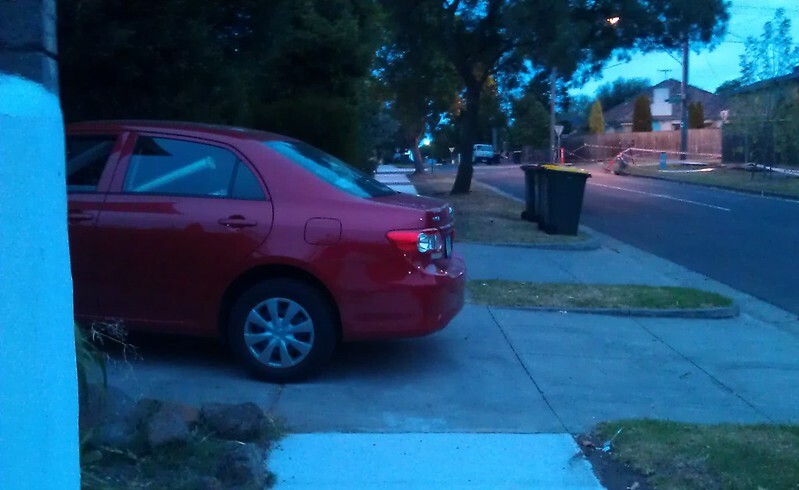 It’s particularly galling when there is plenty of space on the street (or in the driveway they’re not quite using). People are just being lazy — as well as thoughtless and inconsiderate. Perhaps a better way for Councils to deal with it would be to do as per the trees: first send a notice advising people not to illegally block the footpath… if they keep doing it, get a contractor to tow the car and charge them costs. I haven’t decided who to vote for yet. Oscar Lobo, pictured above, is running again, and was one of those who responded to my queries on public transport the last time around, along with Jamie Hyams, who I ran into in Centre Road on Saturday morning. Also spotted recently around the streets have been Brett Mason Hedger (Greens) and Rose Read (Greens — she introduced herself to me on the train one morning, and we had a good chat). It’ll be interesting to see how this plays out as the campaign hots up in the next few weeks. Update: The complete list of candidates (for every council area) has been posted on the VEC web site. In Tucker Ward, there are 14 candidates for 3 seats.